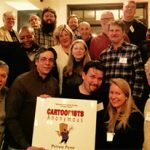 We Are the Chicago Chapter of the NCS (National Cartoonist Society). Our NCS Chapter participates in many events throughout the year. If you’re interested in having us at your event, give us a holler. We draw comics, we animate, we educate and we get together to talk shop and have a good time. We’re based in the Chicagoland area and our members are located throughout the country.